« Franchisees: Independent Contractors or Employees? Cavalcade of Risk – Emily Holbrook hosts this week’s Cavalcade of Risk at Risk Management Monitor – go check it out. If you are interested in risk and insurance – and presumably so if you are reading this blog — then RMM should be on your must-read blog list. If you aren’t familiar with it yet, take a few minutes to poke around the archives Emily and Jared consistently do a terrific job on an array of risk related matters. It covers everything from bedbugs to earthquake hotspots. Prescription drugs – Joe Paduda talks about the recent WCRI benchmark report on prescription drugs in Washington and explains why what works in Washington likely won’t work elsewhere. Spinal Cord Injuries – Kelly Scott posts about spinal cord injuries, noting that September is spinal cord injury awareness month. 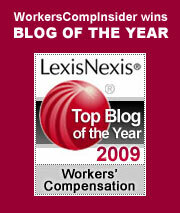 Illinois – Ameet Sachdev of The Chicago Tribune charts changes to the workers compensation law. Cool Tool – We just discovered OSHA’s $afety Pays Cost Estimator, an interactive expert system to assist employers in estimating the costs of occupational injuries and illnesses and the impact on a company’s profitability. Hat tip to the post at Safety Daily Advisor, which talks more about the tool. Reminder: September 22 – If you haven’t signed up yet, head on over to Business Insurance and register for Virtual Advantage 2011 – Workers Comp Trends & Cost Control Strategies. We’re very pleased that our own Tom Lynch will be participating on a blogger panel with three other blog luminaries: Roberto Ceniceros, Joe Paduda, and Mark Walls. There will also be a keynote by NCCI’s Harry Shuford, an expert panel on pharmaceutical cost controls for worker’s comp – and more. It’s a one-day virtual conference – and best of all – there is no charge to attend. This entry was posted on Wednesday, September 7th, 2011 at 12:07 pm	and is filed under News roundups. You can follow any responses to this entry through the RSS 2.0 feed. Both comments and pings are currently closed.